A statement was issued by the group on Thursday, six months after the latest conflict, which saw Israel roll out Operation Protective Edge. That brought about eight weeks of bombardment, followed by a devastating ground assault. Oxfam’s statement outlines how “the situation in Gaza is becoming increasingly desperate” and calling for the lifting of the eight-year blockade, as well as a continuation of peace talks. “Only an end to the blockade of Gaza will ensure that people can rebuild their lives,” Regional Director Catherine Essoyan said. With it in place, the flow of construction materials in and agricultural produce out is having a crippling effect on the lives of Palestinians. According to the NGO, new figures reveal a drop last month in construction materials, which are vital to the efforts. 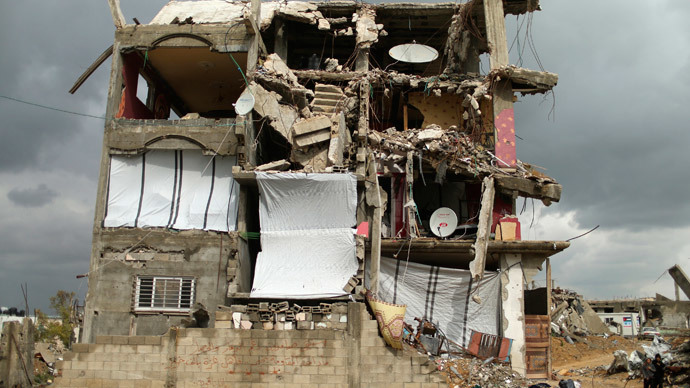 "Less than 0.25 percent of the truckloads of essential construction materials needed have entered Gaza in the past three months," the statement also said. In pure figures, over 800,000 truckloads of such materials are still required to repair the infrastructure damaged in last summer’s operation alone – Israel’s bloodiest in years – which claimed 2,200 Palestinian lives, most of them civilians. About 100,000 of these people still live in shelters and other makeshift or temporary accommodation because of this lack of materials. “Tens of thousands more are living in badly damaged homes,” Oxfam ads. “Families have been living in homes without roofs, walls or windows for the past six months. Many have just six hours of electricity a day and are without running water. Every day that people are unable to build is putting more lives at risk. It is utterly deplorable that the international community is once again failing the people of Gaza when they need it most,” Essoyan continues. A further problem concerns food. The charity continues to provide water, food vouchers and health services where it can. In the meantime, no progress has been reached on a diplomatic, long-term solution to the crisis, which was supposed to take effect after the ceasefire. As the separation between the Gaza Strip and the West Bank persists, people continue to be trapped. The same goes for the border with Egypt, which has been shut for the past two months, preventing thousands from leaving.